The Deluxe white goose down pillows provides the softest feel underyour head whether you are sleeping or propped up reading yourfavorite book. Unlike other pillows that seem to flatten a littlemore each day, this one is built to always have the fullness of abrand new pillow. 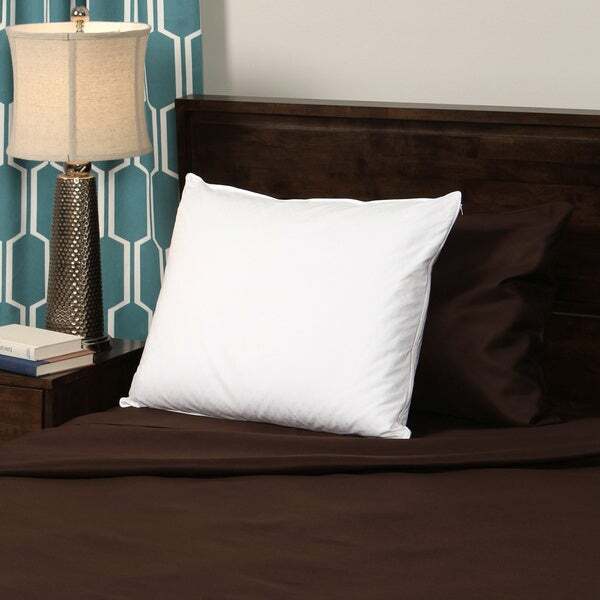 Its unique design offers you a separate pillowcover in a high 330-thread count, which includes a zipper for easyremoval. The Deluxe Down pillow allows you to easily remove thecover periodically for cleaning, which will add to the life ofthese already long-lasting pillows. The Durawash™ process, providing the cleanest Allergen-Free RDSDown on the market. Our Durawash™ method includes multiple washes in ,environmentally friendly detergent and allows ALLIED to recycleover 65 million gallons of water annually. Testing measures turbidity, and while 400mm+ is consideredHypoallergenic, Allied's RDS certified Down consistently measuresat 1000mm+ - proving to be the cleanest down available. And as abluesign® system partner, no harsh chemicals, detergents orbleach is used and no detergents are ever discharged into theenvironment. This is the best pillow I have ever slept on and well worth every dollar spent. It gives support to my head/neck while providing billowy softness. I no longer wake up with a stiff neck, shoulders, and shoulder blades. My pillow and I now have a "loving relationship" with no more fighting during the night trying to get comfortable. I bought 2 king size pillows and they are perfect for my bed. They definitely hold their shape and fluffiness. There was no smell and I was able to sleep on them the first night upon their arrival. I am extremely please with my purchase, the promptness of their arrival, and I have bragged on my pillows and my restful sleep that I have had to all my friends who are still waking up during the night having pillow fights. Highly recommend these down filled pillows if you are looking for a good nights sleep. I felt the need to splurge on a great pillow, and I have not regretted any second of it. My seep is noticeably better! I was hoping this pillow would be softer. It is so firm, it hurts my neck to sleep on it. Fine for me, but my husband thought that they were a little flat. "Is this 100% goose down?" Hello 911rn, this is 100% goose down. Thanks for shopping with us! "What percentage of down is this pillow?" Hello Down enthusiast, the fill power is 550 and the thread count is 330. Please let us know if you have any further questions.